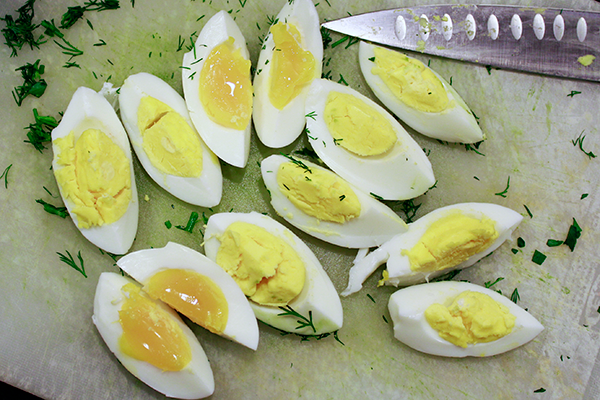 boiled eggs, potatoes and dill (Peter). Also known as "green borscht" (although not in my house) you don't have to use sorrel - spinach or chard leaves work as well. But if using them add the juice of one large lemon (to match sorrel's acidity). 3-5 cups loosely packed chopped sorrel leaves - or spinach or chard leaves. 1. Cut onions kinda small and add to the butter or oil in your soup pot and heat. After 5 minutes or add the crushed garlic. 2. Put on a medium pot of water for the eggs. When boiling, add eggs, bring back to boil and simmer 15 minutes. 4. Cut carrots and potatoes into morsels suitable for a soup spoon or the size of your eater's mouths and add. Heat and gently boil for 8 minutes or so. 5. 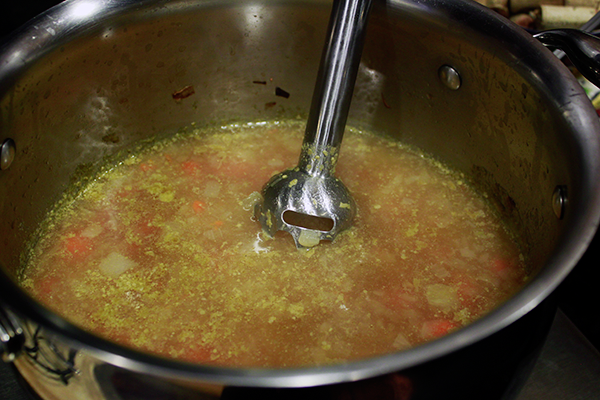 Use your hand blender and blend up about a quarter of the soup to improve texture and thickness. Sorrel (or chard) parsley and dill. 6. 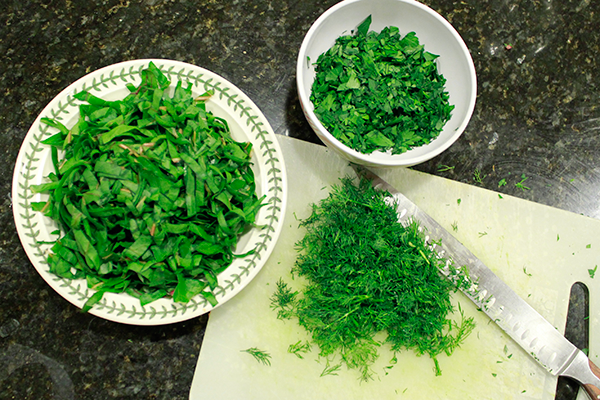 Add sorrel leaves (or spinach or chard) chopped into pieces around 1/4" x 2". Wait about 5 minute then add chopped parsley and the eggs cut into eighths. 7. Now add about 3 teaspoons salt and 2 teaspoons ground pepper and the lemon juice (if using chard or spinach). Test for flavor: it should be pleasingly salty and slightly tangy. Add more salt or lemon as needed. 8. Serve with dill, sour cream and garlic bread. Two or three smoked pork (ham) hocks boiled gently in half a pot of water for 90 minutes or so. Remove, strain, place stock in fridge overnight, scoop off fat before using. Cut up meat from pork hocks (if any) and add to soup at the end. For sorrel soup (and borscht & kapusta) best to use a nice strong pork stock.